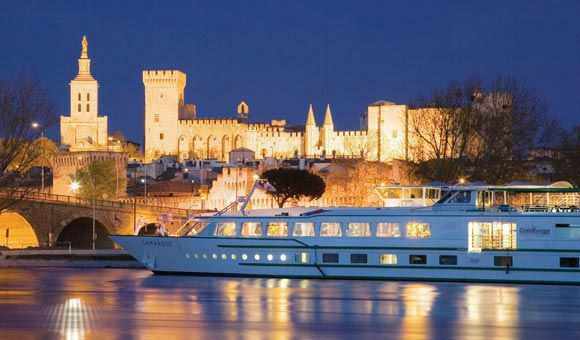 CroisiEurope is a family-owned French river cruise company with over 30 ships in Europe. Established in 1976 it manages all aspects of its cruises – ship design and build, cuisine and hotel services. This guarantees the excellent value for money of a CroisiEurope cruise. The distinctly French ambience on board appeals to customers across Europe, and staff speak many languages. This style extends to the food on board - you cruise the rivers of Europe aboard your own French restaurant! The high quality of food and superb service has received great praise from Blue Water Holidays customers. Enjoy complimentary unlimited beverages, including wine and beer, soft drinks and mineral water, throughout cruises between April and October. With just 100-180 passengers on board, these 2 or 3-deck river cruise ships offer an intimate relaxing atmosphere, yet with modern amenities. The cabins offer panoramic views above water level, with en suite bathroom facilities, air conditioning, satellite TV, hairdryer and personal safe. The lounge and bar area is the social hub of the ship, and the sun deck offers all-round views of the passing scenery. Free wi-fi is available on all CroisiEurope ships throughout the fleet in the reception area and lounge bar. Latest ships offer wi-fi throughout. Due to the strong relationship between Blue Water Holidays and CroisiEurope, we can offer our customers very flexible cruise options with ABTA financial security. Cruise Only options enables passengers to organise their own travel resulting in maximum flexibility, or we can add flights and transfers to suit your requirements, including pre- and post-cruise hotel stays, to create an ATOL protected package. Check out this website and call our team on 01756 706514 (+44 1756 706514) from outside the UK) for advice and to book your CroisiEurope Cruise. Blue Water Holidays are pleased to announce that we are offering 7-night cruises along the spectacular Loire Valley on board brand new innovatory paddlewheel ship Loire Princess! Special savings on 5 and 13 April departures! Special savings on 13, 25 Apr and 7 May departures!